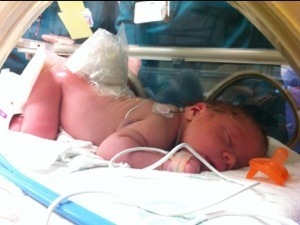 Welcome to the world, Colten! I started this post around 6:30 AM on Wednesday – yesterday, under the assumption I wouldn’t have time or desire to do a recap of the day by late tonight. So today’s post was going to be logbook style… Then so much was brought into us and we had some serious decisions to make. I simply did not have time to log updates all day. Good thinking anyhow! We are humbled and overwhelmed by support from everyone. The emails, texts, calls, blog posts and Facebook posts have been such a positive force for us – THANK YOU! Last night I had a very positive dream about Colten. While I don’t recall the details it revolved around the staff at Sparrow being so excited when he came out because they felt so good about the location of his sac and his prognosis. That made me feel good and I actually got excited thinking about it! I’m waiting in the car while Richard runs into The Cigar Connoisseur, downtown Lansing. Nothing like waiting till the last minute! We need to check-in at Sparrow at 10. We are always late though so no surprise there. What a day. I’m currently in a “mom & baby” room at Sparrow. Colten is on his way to Ann Arbor via ambulance (non-emergency, for a surgical transfer). Richard is on his way to Ann Arbor as well. There’s really a lot to say but anything we say is speculation until further tests are done and surgery is complete. So in short, the sac was huge – almost the entire width of him. While it came out intact, it ruptured quickly due to the tension. Colten is on double-antibiotics to prevent meningitis and any other local infection. The picture immediately below shoes the sac wrapped up in moist gauze then sealed for protection until surgery. IF YOU WANT TO SEE a very nasty picture of the sac (ruptured) with the spinal meninges in it, you can click here. If you are squeamish though, don’t bother looking. Click here to view the medical file picture of Colten’s sac. The neurosurgeon came to talk with us and said Colten has no neurological response in his feet or legs except for the right quad. He responds to some pricks and prods so he has some feeling but is not displaying active movement or normal reflexes. This translates to a lot of physical therapy, mobility assistive devices and potentially a wheelchair. But we have decided its not up to the neurosurgeon to predict Colten’s life, it’s up to Colten – with great help from all those around him. The neurosurgeon also led is to believe both his feet are clubbed. The neonatology nurse practitioner and NICU staff led us to believe this may not be true though. He’s so bent up because of being cramped inside its hard to really tell. 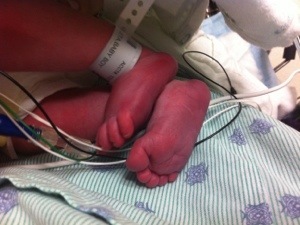 The neurosurgeon also was pretty confident that Colten would need a shunt earlier rather than later. So due to the more extensive damages than anticipated, we decided to transfer Colten to Mott Children’s Hospital for his surgeries. Once he’s checked out there we may have a completely or slightly different prognosis. They will run a few tests (CAT scan, MRI, ultrasound, echocardiogram) and we will go from there. 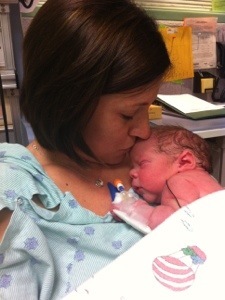 On a PHENOMENAL note, we got to kiss the sweet boy after delivery before he was taken to RNICU. And after two hours of staying in recovery after the section, I was taken up to RNICU for about 30 minutes and could touch him through the isolate (sp?). Best thing though? He was scheduled for a transfer to Ann Arbor at 7PM, so at 6:30 I was wheeled up to say goodbye to him. 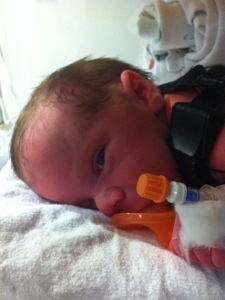 They took him out and let me hold him… Then the transfer was delayed till about 10:30 PM. I got to hold him for almost 3.5 hours. He just slept contentedly in my arms that whole time. LOVED THAT! So now we are between two hospitals… My dad went with Richard to Mott’s, and my dearest friend Kristen slept here last night with me. I heard from Richard a few hours ago with vague details that testing would all get run Thursday AM and ideally the surgery would be done midday on Thursday. And that’s all we have for right now… Happy Birthday Colten! There are more pictures in the Photo Stream link at the top of this website. This entry was tagged Birth, c-section. Bookmark the permalink.